Introduction: With the rainy weather upon us Cal and I decided to forgo fishing and headed into the lab for a full day of tackle measurements and autopsies. By the end of the day the lab was filled with the fumes from burning plastic and discarded hardware from sacrificed lures littered the workbench. Suffice to say it was a tackle massacre. 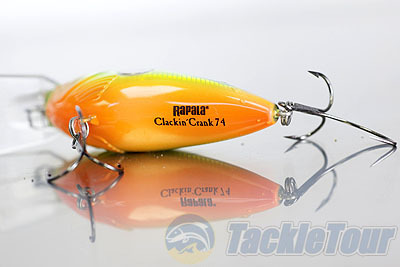 The first victim to go under the knife was a lure that we wanted to take a closer look at since it was very first introduced, the Rapala Clackin' Crank. 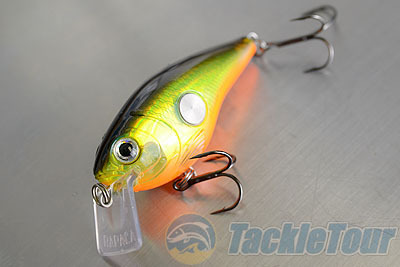 What is that metal circle on the side of the Rapala Clackin' Crank? Its the Clackin' Cadence Rattle. 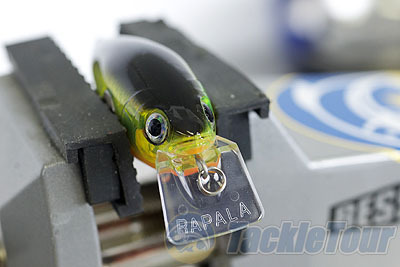 The Rapala Clackin' Crank feature's the company's immediately identifiable Clackin' Cadence Rattle System which exposes the ends of the solid rattle on both sides of the bait. 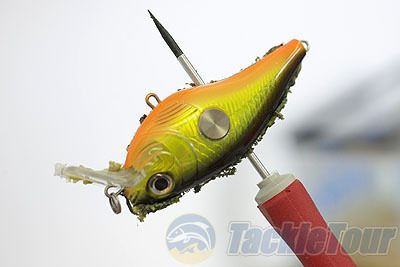 On each end are metal discs so that vibration from the enclosed chamber immediately transfers into the water each time the single steel ball bearing clicks side to side as the lure is retrieved. The lure features a angled diving lip to drive the lure down between 3 to 5 feet depending on model. The square lipped design also helps the bait more easily deflect off structure. 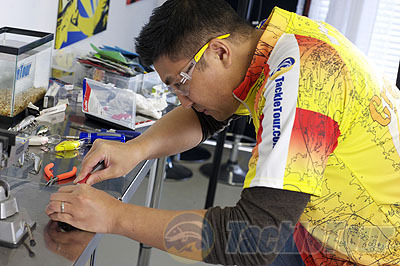 For our autopsy we volunteered a Clackin' Crank 74 which is the longest bait in the lineup at 2 3/4". The lure weighed in at 5/8oz. with most of that weight coming from the rattle chamber. The lure comes armed with a VMC black nickel belly hook and a VMC SureSet tail hook which features one extra long wide gapped point for improved hookups. In the test tank the lure exhibits a slow rise to the surface and is slightly front weighted so that the bait has a nose-down posture to further aid in deflection. 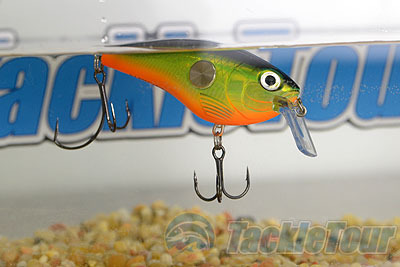 The Clackin' Crank has a semi translucent finish and textured body design, but once the lure is moved it seems to flash aggressively. The flash comes not from the bait's exterior but from inside the bait where there appeared to be a holographic film. It was time to take a closer look and crack this lure open. Trapped between the jaws of our vise the Clackin' Crank was easy enough to cut from end to end but actually separating the two sides proved to be an entirely different matter. 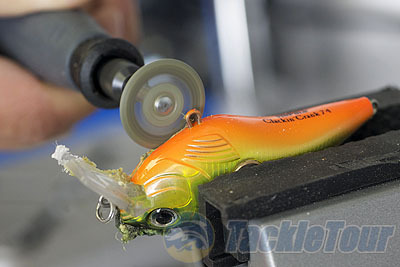 Even though I could now peer into the bait the Clackin' Crank was still held firmly together by the Cadence Rattle System. No matter how I maneuvered the blade or pried at the lure with a screwdriver it simply did not want to separate. I then realized that the rattle system is housed completely within a plastic cylinder and fused end to end so the water can never leak through the edges of the system. Next Section: Why can't I crack this lure open? !